My one week sock-knitting hiatus has been successful! I mean, I haven't actually made it a week yet, but that's not what I mean. The main purpose of denying myself sock knitting was to work on my qiviut cowl. And guess what? It's blocking right now! Yay! Last night was the most challenging part of the whole project: grafting the two sides together. 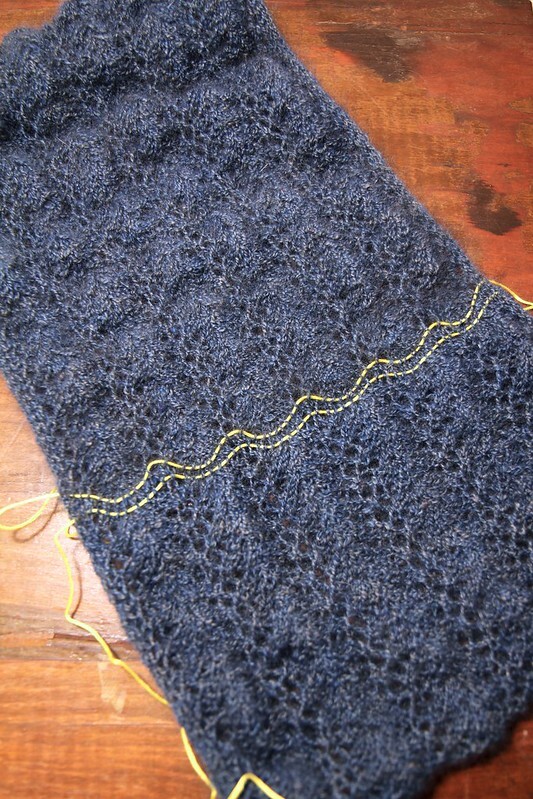 I've grafted stockinette before, but never lace. So yeah, I was ridiculously worked up about it. So I put in a lifeline in both sides before grafting. The purpose was to be able to easily pick the stitches back up if (and when) the grafting went horribly wrong. But the end result was that, once the sides had been grafted together, the grafted row was perfectly highlighted so it was super cake to go back and straighten up the tension. Unintentionally brilliant. So now my cowl is all finished and blocking and I have enough leftover yarn to make a matching hat (which will require some math so I'll get started on it later). And since my cowl is all done, I can lift the sock knitting embargo! Tomorrow, I'm going to ball some yarn! Whoo! !